Family focused wealth management firm with offices in New York and Florida. Ciccarelli Advisory Services came BizWonk with the main goals of engaging existing clients and attracting new, qualified clients while working within the stringent rules and regulations for marketing in the financial industry. With offices in Florida and New York they were struggling with a way to convey messages to clients in both locations. They knew the value of internet marketing, but where unsure of what services would work best for there company and industry. 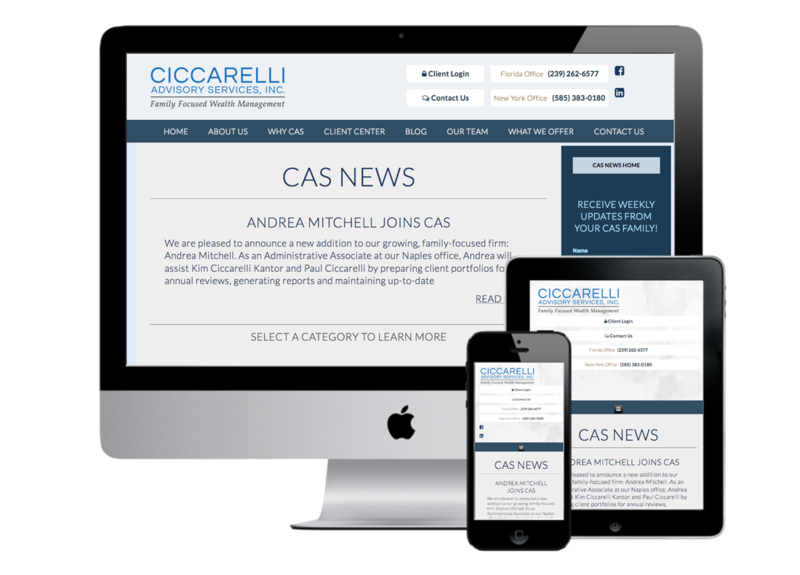 BizWonk evaluated Ciccarelli Advisory Services’ existing website, blog and social media marketing efforts. From there we worked with Ciccarelli Advisory Services to develop a marketing strategy that included organic SEO and social media marketing to increase traffic and visibility in the search engines. Through continued blogging, SMM, and website updates they keep fresh content in front existing customers. Using Facebook Ciccarelli is able to engage with existing clients and keep them up to date on the latest happenings at both offices. Over the last 2 years they have seen a growth in traffic and engagement on the website, blog, and Facebook.